The fifth staging of Animation is set for August 16th 2014! 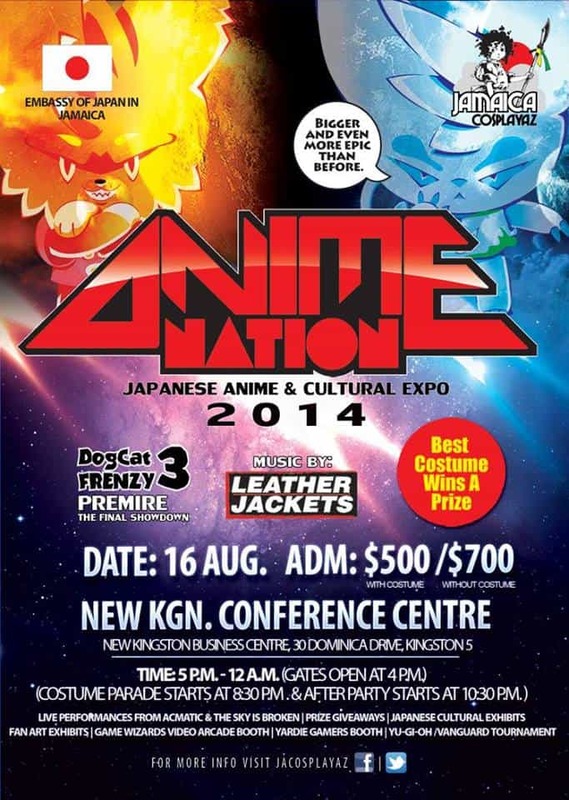 Jamaica’s premiere cosplay, anime and gaming event returns, this time at the New Kingston Conference Centre. The event will feature live performances, Japanese cultural exhibits, gaming booths, prizes, giveaways and of course cosplay. Poster for the event below. The stars didn’t align and my plans for Anime Nation 2014 will not be able to be a reality but I will definitely be attending the event to get pictures and videos to share. Maybe anime nation 2015 will allow me to finally cosplay and display my anime figure collection. See you at Anime Nation 2014! Check out video and photographs from Anime Nation 2013, follow @Jamaipanese on Twitter and subscribe to the Jamaipanese Youtube Channel for updates on ANime Nation 2014.